Bow Creek Metal, Inc. is a family owned and operated business built on quality and reliable, personalized service. Since 2000, Bow Creek Metal has offered a wide range of products and services. What began as a shop created to meet the needs of local farmers has grown to a thriving business that offers Contract Manufacturing, Custom Metal Fabrication, Industrial Powder Coating, and Ornamental Metals. Today, along with their sister company Tuff Go, Bow Creek Metal offers a variety of services and products including unique, customized site furnishings such as benches, waste receptacles, railings, campfire rings, and much more. 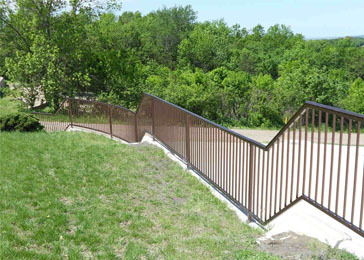 Bow Creek Metal is a Government Approved Manufacturer and has completed many projects for parks and recreations, municipalities and private and non-profit businesses. We look forward to working with you and discussing your upcoming project. Contact us for a full review of your ideas and needs. Bow Creek Metal works with a variety of metals from carbon steel, stainless steel, aluminum, and specialty items. We also work with large and small projects, contract manufacturing of multiple items, and much more. Quality is one of the cornerstones of Bow Creek Metal, Inc. All materials used by Bow Creek Metal are of high quality. Bow Creek Metal inspects projects throughout the process to insure that all specifications are met, than once the project is completed a final inspection is done. From fabrication, machining, welding, painting, assembly, quality control and testing, it's all done here without outsourcing. Everything is in house to allow quality control every step of the way.